this article is part of an ongoing series examining the entire Harvest Moon franchise. see the main article and index here. I always assumed this was part of the 10th Anniversary reboots that included Rune Factory and Innocent Life. 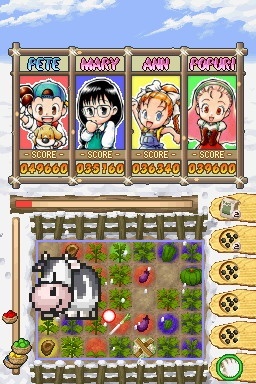 It’s entirely unlike any other Harvest Moon game, using a Harvest Moon skin for a puzzle game that I’m told is similar to Panel de Pon. 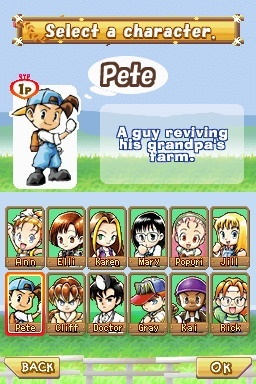 QUICK FACT: Bears almost no resemblance to a Harvest Moon game, save for the fact that you do farm as part of the puzzle and you play against Harvest Moon characters. 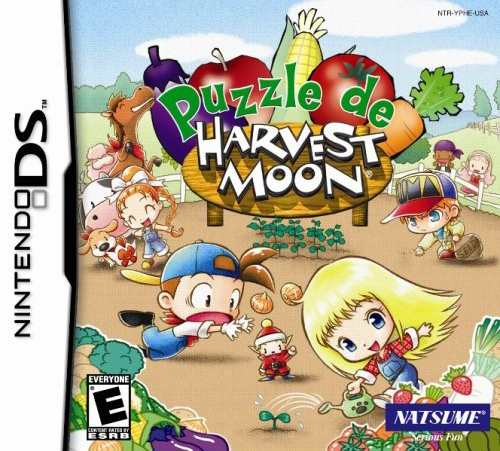 QUICK FACT: The only Harvest Moon that is a North American exclusive. GAME LENGTH: There’s no story mode. There is a multiplayer mode for wireless versus play with a friend, and a single player mode with four styles of play. You can play and beat all the characters offered (12) and you can play 4 minute, 6 minute, or 8 minute modes. When you start a single player game, you are allowed to choose which mode you will play, then your character, then your difficulty setting, color, and time limit. You have a row of items on the right hand side you use in the field of play, the timer bar appears above, and the score comparison appears on the left, with the characters and their actual score on the top screen. The field is a regular field to be farmed, with plots on a grid, and your items are things like seeds, fertilizer, water, and a harvesting basket that disappear and reappear in random quantities as you use them. You progress through said items like you would in a regular Harvest Moon game, with the plants represented in your color on the field. When it comes time to harvest them, you can either use the basket or rub them to do a manual harvest. You can also harvest the crops of others, but it’s not worth as many points. The thing is, all this is going on in the space of a few seconds. It’s highly competitive and very manic. The computer characters will constantly have stuff flying all over the screen. You can claim plants as yours by surrounding another player’s plot with your seeds, and you can also unleash various catastrophes (in the guise of animals like sheep, horses, and dogs) that do things like limit available items down to one, destroy plants, and make a nuisance of itself. The four single player options are Normal, 2 vs. 2, Quota, and Survival. Four characters always play a puzzle, and it always lasts all four seasons no matter how long you set the time. Normal is a regular game where the scores are tallied up at the end of the seasons and there is first through fourth place at the end, 2 vs. 2 has two teams instead of four, Quota only scores one type of crop, and Survival doesn’t let you advance to the next season if you aren’t in first place. The mechanics are sound, and it’s a fine puzzle. The manic fast pace makes it fun to play. The problem is that, even as a puzzle game, it is sorely lacking in content. Most puzzle games have goal-oriented story modes, or challenges that you can complete. There are none here. After you play through a few times, you’ve seen everything there is to offer. You can turn the difficulty up all the way, and work on beating your old high score, but there is no reward for doing this, as you will still finish all the puzzles except survival in the time period that you specified regardless of how much or little you tried. It took me about ten minutes to realize I’d seen it all. As I said, I was under the impression that this was part of the “10th Anniversary” Harvest Moon series of re-imaginings, along with Innocent Life: A Futuristic Harvest Moon and Rune Factory: A Fantasy Harvest Moon. They all came out in America at the same time, and are all departures from the series, but Puzzle de Harvest Moon is way less of a game than the other two. The developer, Platinum Egg, has not made another game before or since. That it wasn’t developed by Marvelous isn’t unusual in the context of the 10th Anniversary games though, since they didn’t work on any of them (just published them in Japan). On a final note, it’s interesting to me that all the Harvest Moon games come out here, and even more interesting that the series is popular enough to merit a North American exclusive. It’s a shame the experiment didn’t work out, though. RANK: The bottom. My least favorite of all the Harvest Moon games.